Embroidered booties are one of this season's most desired styles. Little flowers and leaves embellish the shoe, nature is just an inexhaustible and amazing source of inspiration as ever. A me piacciono da impazzire... il mio è un SI!!!! YES! I´m in love with these boots too. Perfect for Boho Style at autumn. I would like to wear these shoes with dresses an with Skinny-Pants. Your selection is grear dear Lilli. Thank you for the inspiration. 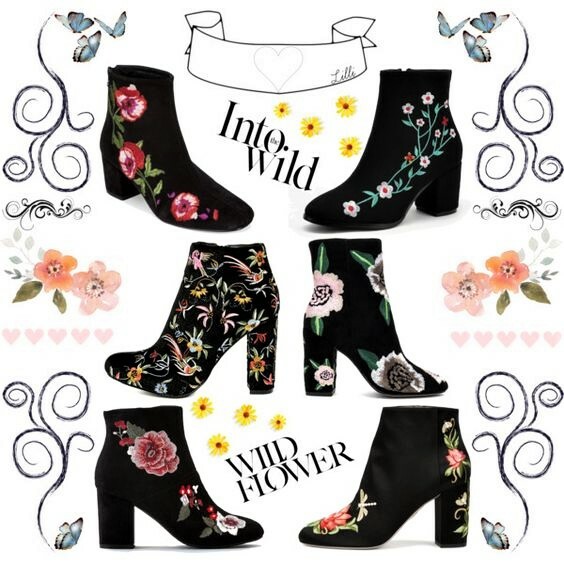 These are so pretty but not really my style so this trend is not for me but I could totally see you rocking a pair of floral embroidered boots this fall Lilli :) Happy weekend! I see them a lot over here too. They are so stylish and pretty.